This is a 'square' teardrop design, loosely based on the Grasshopper and more closely based on Buford's original Mini-Hopper. 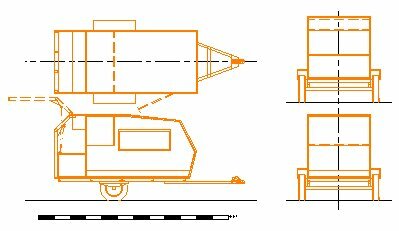 One change is to make the whole rear a galley hatch, like a normal teardrop - this requires a crank on the rear to provide full headroom under the lifted hatch. The trailer is designed to fit on the Harbor Freight utility trailer.